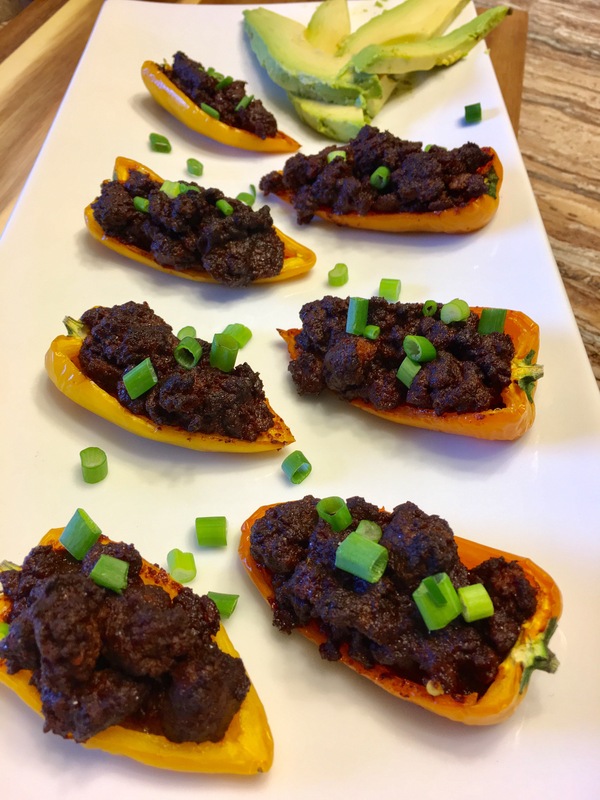 These stuffed sweet peppers work perfectly for tapas! The yellow ones and orange ones are more sweet than the red ones. I don’t recommend using the green ones, they’re very bitter. I purchased these in a bag at my grocery store. They’re the mini-sweet peppers! I stuffed them with some extra yummy longhorn ground beef that I picked up at the New Braunfels, Tx farmer market last weekend! I’m super excited to use this meat! This longhorn meet is very flavorful and has more protein than ground beef! But you can use regular ground beef or ground pork! Make these at your next social gathering or for fun! Melt the cooking fat in a large skillet on medium-high heat. Add the ground beef and fully cook. Meanwhile, pre-heat the oven to 375 degrees Fahrenheit and line a baking pan with parchment paper. Next, add the tomato paste, water, and the spices to the skillet. Stir all the ingredients and lower to a simmer. Allow this to simmer for about 10 minutes. Remove any seeds from your pepper. Once the chili meat mixture is done, stuff the peppers and cook for 15 minutes. Once done cooking, top with chives and enjoy!